From the Roman Breviary of 1529, the continuation of the sermon for the feast of All Saints. 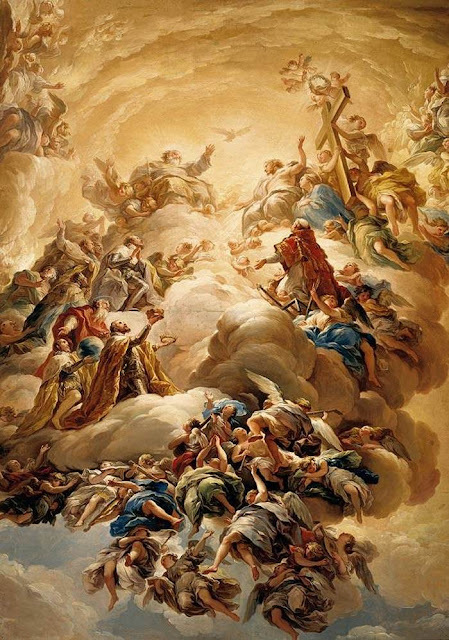 Now therefore, dearest brethren, at the origin of all the Saints, we must name, praise and glorify Him who made them, through whom all things were made, through whom all parts of the world subsist, whose majesty beginneth not nor endeth forever, that He may rightly be named as the beginning and end of every creature. Whence it was said by a wise man, “All wisdom is from the Lord God, and hath been always with Him, and is before all time. Who hath measured the height of heaven, and the breadth of the earth, and the depth of the abyss? Who hath numbered the sand of the sea, and the drops of rain, and the days of the world?” (Sirach 1, 1-2) He alone can search out and measure and number all these things, who in His wisdom encompasseth the circuit of heaven, and in His might reacheth unto the depth of the abyss.